Gaelicdreams.com, our parent company, and Tartan4U.com are direct importers of quality merchandise directly from Scotland , Ireland and the rest of the United Kingdom. All merchandise that we sell or distribute is maufactured by skilled craftsmen with expertise in their respective fields.Dealing with the best maufacturers allows us to maintain a level of quality that consumers expect and deserve. Located in the Commonwealth of Kentucky USA, we distribute to all fifty United States as well as Canada and Europe. Click here to view the products and services page. In addition,Gaelicdreams.com is a company that specializes in researching name origins.Our data base contains more then 2 million names and is growing every day. We offer a full range of Name Origin & Heraldry Scrolls,printed on fine acid free paper,available either framed or unframed.We can also provide you with discriminating gifts and accessories with a Scottish or Irish influence.All of the Scottish Clan products that we carry are approved by the Standing Council of Scottish Chiefs and are manufactured in Scotland.Many of the gifts that we offer may be personalized with your Christian name or surname as well as the associated families' Coat of Arms, Clan Crest,Chief's Crest,or Clan Tartan.All representations of Coat's of Arms are those documented by "Sir Bernard Burke"C.B. ;LL.D;,Ulster King of Arms to the Queen (1842) in " Burke's General Armory" or other heraldic registries and is easily verified.These are intended for personal display as a record of ones heritage. The histories that we present are guarenteed to be authentic and accurate as much as historical records will allow, however please be aware that these cover general history for a given name and may not indicate a direct decent from the title holder or clan chief.The rules of heraldry are very strict and are enforceable in most courts.Displaying arms grated to another individual and claiming them as your own may entail legal action. If you hold a legitimate right to bear arms you should have them atriculated in the appropriate registry of the country of origin.Those of American,Canadian,English,Welsh,Scottish or Irish decent may apply for a new grant of arms. Other sites in the Gaelicdreams.com family of websites. 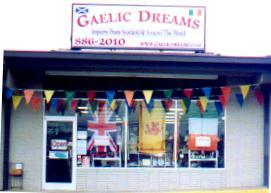 Gaelic Dreams Imports has a new retail location located at 2711 Ft. Campbell Blvd., in Hopkinsville KY. If you happen to be in the area please stop by and say Hi.. Many of the items available through this site are also available in the retail store. Our 3000 square foot showroom is always brimming with quality gifts and clan regalia. Clan products ,Irish ,English and Welsh gifts.Clan crest images and information about clan membership and septs is available online.